THIS PAGE IS FOR MAC OS X USERS! If you use WINDOWS, click here! FOLLOW THESE STEPS TO REGISTER - IT'S QUICK AND EASY! Step 1: Try the trial version! It works the same as the full version, so you'll know what you're getting. Step 2: Check the boxes on the left of the screensavers you want, then scroll down and click Proceed To Checkout. Payment can be made using your credit card thru the safety of our eSellerate store, or thru PayPal. It's all safe and secure, and you'll be able to download your screen saver the instant your payment is made! Step 3: Check your email! Instructions will be sent to the email address you provide, so make sure it's working! Check your junk folders just in case! You can also download from the THANK YOU screen straight away! Step 4: Sit back and enjoy the useless fun! SPECIAL DISCOUNT OFFER FOR MAC USERS! SAVE $$$s! We currently have a special offer available for Mac users. If you register 1 screensaver, you save $1 off the price of each additional screensaver you purchase now too! SPECIAL SALE!! EVERYTHING ON THIS PAGE REDUCED TO $3.99!! Check the boxes next to the products you wish to purchase, then click Proceed To Checkout at the bottom! If you don't want to use PayPal, you don't have to. Click here to go to our eSellerate online store to pay securely with your credit card. 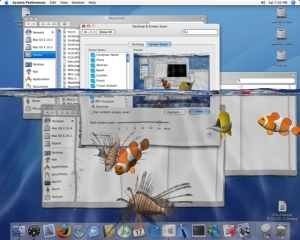 Something Fishy: 3D Desktop Aquarium Screen Saver for Mac OS X - Watch as your monitor fills with water and real 3D fish invade your desktop! THIS IS THE ONE THAT FILLS THE SCREEN WITH WATER! 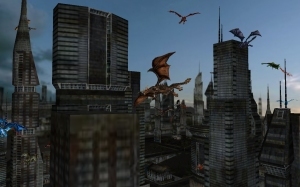 Dragon City 3D Screen Saver for Mac OS X - Fly with real 3D dragons thru an amazing 3D city as they weave between skyscrapers and beathe fire! 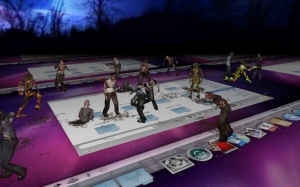 3D Desktop Zombies! Screen Saver for Mac OS X - Celebrate Halloween in style! Watch as the undead come back to life and roam your desktop, fighting, crawling, and leaving messy footprints, blood and gore, all over the screen you were just working on, or any other image! 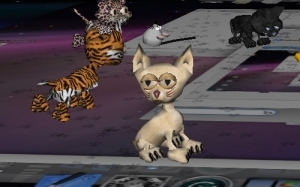 3D Desktop Kitty Cats Screen Saver for Mac OS X - Watch as the screen you were just working on is turned into a 3D playground for real 3D kitty cats! They run around playing with cat toys and leaving footprints all over your desktop, or any other image you like! 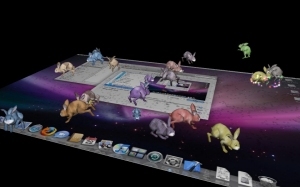 3D Desktop Bunny Rabbits Screen Saver for Mac OS X - Watch as the screen you were just working on is invaded by real 3D bunny rabbits! 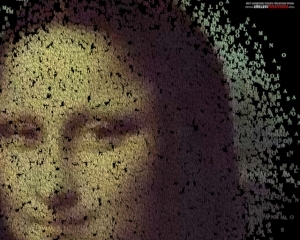 They hop around leaving footprints all over your desktop, or any other image you like! But watch out, they breed like... well... rabbits! 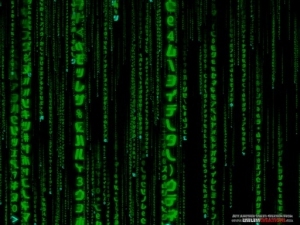 The 3D Matrix Code Screen Saver for Mac OS X - still the best 3D/2D Matrix screensaver available, or so I'm told! 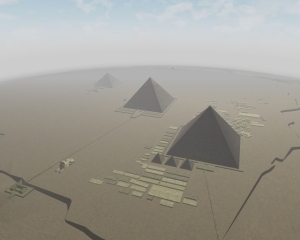 Pyramids of Egypt 3D Screen Saver for Mac OS X - Pay a virtual visit to the Giza Plateau and experience the famous Pyramids of Egypt, without having to put up with the tourists! 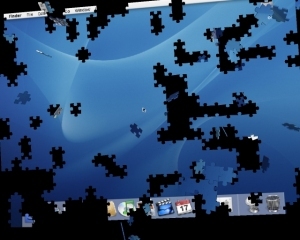 3D Desktop Jigsaw Puzzle Screen Saver for Mac OS X - Watch as your desktop, or any other image you like, is broken up into a jigsaw puzzle and slowly put back together! 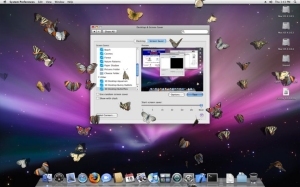 3D Desktop Butterflies Screen Saver for Mac OS X - Watch as different types of butterfly begin to flutter around, and land on, your desktop! Cupid's 3D Valentine's Day Screen Saver for Mac OS X - Display images of your Valentine - or whatever you want - behind a sea of 3D floating hearts as Cupid takes shots at them with his bow and arrow! Desktop Puddle Screen Saver for Mac OS X - Watch your screen turn to a watery puddle and ripple with this realistic water effect screensaver! Rock, Paper, Scissors 3D Screen Saver for Mac OS X - The worlds first 3D Rock, Paper, Scissors simulator! Santa and the City 3D Screen Saver for Mac OS X - Fly with Santa and this reindeer thru an amazingly detailed, real-time 3D city! THIS IS THE ONE WITH THE 3D CITY! 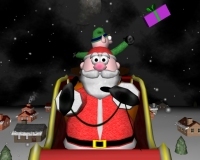 A Very 3D Christmas Screen Saver for Mac OS X - Watch how Santa manages to deliver all those presents on Christmas eve, all in 3D! THIS IS THE CARTOONY CHRISTMAS SCREEN SAVER WHERE THE ELF THROWS PRESENTS! 3D Desktop Cars Screen Saver for Mac OS X - Start your engines! 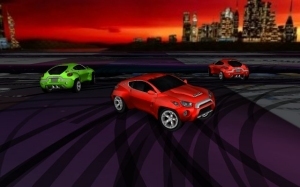 Watch as real 3D cars rip up your desktop leaving skid marks in 3D! More cars available for download for the full version! 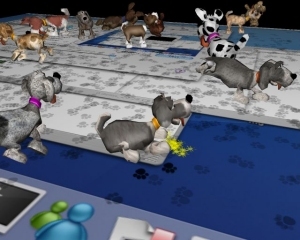 3D Desktop Dogs Screen Saver for Mac OS X - Watch as your desktop (or any other image) becomes a playground for real 3D puppy dogs! The full version includes 5 different dogs, with 25 colours/patterns each! 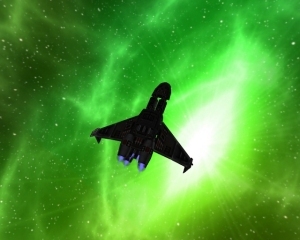 SPACE WARS 3D Screen Saver for Mac OS X - Like a scene from your favourite sci-fi movie, watch as fleets of space ships wage war among the stars! 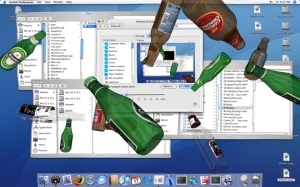 3D Beers of the World Screen Saver for Mac OS X - Watch real 3D beer bottles float around your screen in real time 3D! With all the beers you love from around the world! When Pigs Fly! 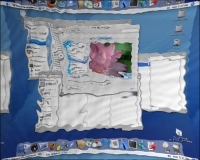 3D Screen Saver for Mac OS X - Forget flying toasters! 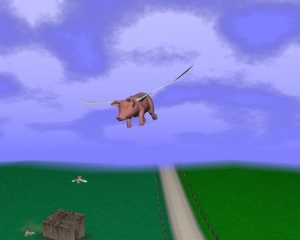 Watch as swine takes to the skies in this stupid, yet fun, 3D flying pig simulator! 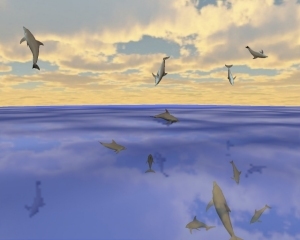 3D Desktop Dolphins Screen Saver for Mac OS X - 2 screensavers in 1- Watch dolphins jump and dive in a 3D ocean scene, or watch them jump and flip on your very desktop! DaVinci Encoded 3D Slideshow Screen Saver for Mac OS X - Watch as artworks appear out of swirling code, or display your own images! Moolah! 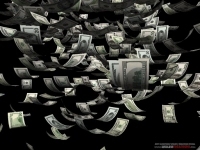 The 3D Money Screen Saver for Mac OS X - Try not to lick the screen as you watch the money float down. Registered version gets you access to all the extra currencies! 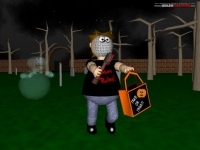 A Horribly 3D Halloween Screen Saver for Mac OS X - Watch as kids on their way home from trick or treating get chased thru the cemetery by candy lovin' ghosts! 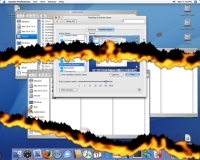 Burning Desktop Screen Saver for Mac OS X - Watch your screen go up in flames with this realistic fire simulation screensaver! Save $1 off each additional screensaver you purchase now! Please Note: When you click the Proceed To Checkout button, your payment will be processed by PayPal. If you would rather not use PayPal, that's fine, click here to visit our online store powered by eSellerate. Once your payment is complete, you should receive an email with instructions within 5 minutes. If you do not receive your email (due to spam filters or whatever) let us know straight away and we'll get you the instructions ASAP. Click here to report a problem.